Exeter Road Garage, established over 20 years in the Newton Abbot area, is a family run business, with a reputation for quality and reliability & providing a friendly and personal service to the local community. The fully equipped garage with modern technology, offers MOTs, servicing and repairs to all make vehicle, plus self-drive vehicle hire, recovery and car sales. Our workshop staff are qualified to high standards and our senior technicians are happy to discuss any problems you may have with your vehicle. Our customers come from all over Devon and we provide a recovery service & courtesy car hire at very reasonable rates. 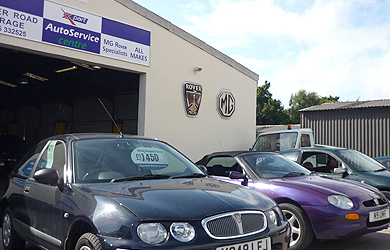 For the last 10 years the company has specialised in MG/Rovers, and since the demise of MG/Rover we have been appointed an Xpart MG/Rover Approved Service Centre. Our technical knowledge includes engine and gearbox rebuilds, cam belt and head gaskets, servicing to MG/Rover manufacturing standards, and the sale of MG/Rover used cars and quality new and used MG/Rover parts. All our work is carried out to dealership standards, and we can keep your service book up to date with either the MG or Rover service stamp. Our technicians are MG/Rover trained to diagnose any problem on your car with Rover T4 diagnostics and access to MG/Rover technical data.